Born in 1933 in Kota, ( Rajasthan ), India. Lalit Jain discovered his true calling very early in life. He completed his primary education from Hathras ( Uttar Pradesh ) where his father a railway station master retired after years of service. He had to curtail his desire to study further as the odds were against him. Lack of a college coupled with financial constraints forced him to move to Delhi to eke out an honest living at a very young age. He started his career designing sewing reel labels for a small printing press near Sadar Bazaar in Old Delhi. It was during this phase that he was appointed by the Archeological Survey of India (ASI) on a short term basis to illustrate pottery and antiquities found on their various excavations. His talent and vision found him a permanent place with ASI and he spent many fruitful years drawing inspirations from his travelogues with them. In his quest of learning in the year 1963, he received a diploma in art from the prestigious Sir J.J School of Art, Mumbai. During his stint with ASI, a veritable treasure trove of Indian art, he sought his inspirations from temple sculptures such as the Mathura, Khajuraho and Ajanta murals. He painted many ancient ruins to life during the day and his own creations on canvas by night. Many of these found a pride of place at the National Museum, New Delhi and won him accolades and recognition galore. 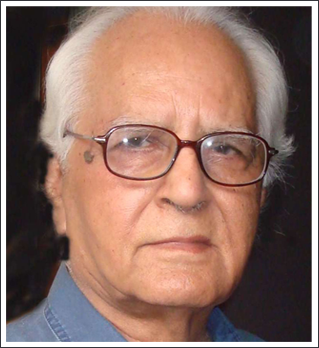 He retired in the year 1991 as Chief Artist from ASI. He has been pursuing his dreams ever since. Painting and creating art that is a celebration of the human form and the mysteries of life. He held many exhibitions which garnered immense media attention and worthy reviews.